Ay de mi. Some people just have to have a label for everything. Instead of trying to bust out, I just shrugged and changed the conversation. Some battles are just not important enough to fight. This man is my brother and walking in love and unity of purpose is more important than the boxes some spend so much time creating and others breaking down. React: In the Corinthian church, some labeled themselves as Pauline. Others of Apollos or Peter (Cephas). These were the people who needed or prided themselves in what we would call today, “denominational labels”. There were others who felt themselves above that. They would go around in their smug superiority saying, “I am a follower of Christ.” In the same way, there are those today who think they have matured beyond old fashioned denominations. There is nothing wrong with being Baptist, of Methodist, or Catholic, or Russian Orthodox, or Amish, or “nondenominational”. These are not divisions. They are organization. They are structure. Structure is good. Organization is good. No organism, including the body of Christ, can live and grow without organization at some level. These denominations only become divisions when we choose not to fellowship or cooperate with anyone from a different label or lack thereof. If I choose to fellowship with my sister because she is presbyterian and I am episcopalian then it is division. If I refuse to help with an outreach that other group is doing for the community because I heard they play Jesus Culture music and that youtube guy said that Jesus Culture is just… wretched, then I am in sin. Peter and Paul, Apollos and James all had different personalities and emphasis in their ministries. Naturally there would be some who would gravitate more towards one or the other. This is fine. I love Gregorian chant and hate bluegrass. I tend to dress casually, even if I am behind the pulpit, and tend to lean stronger on God’s sovereignty than on man’s free will. That all means I might fit better in some churches than in others. That doesn’t mean I am any better or worse than others who fit in different areas. It doesn’t mean I cannot be of one mind or purpose with others of different theological and cultural preferences. As long as we are all under the authority of Christ and following where Jesus might lead, we can be of one mind united in thought and purpose. 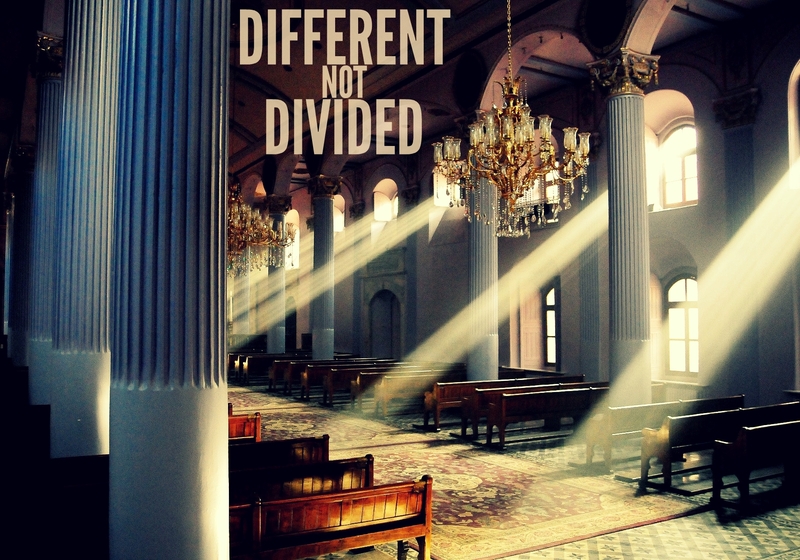 Denominations are not divisions. God, help me to walk in love and unity with my brothers. Help me not to look down on others simply because they might have a different theological emphasis or cultural tradition. Help me to hold fast to the truth You have revealed while recognizing that until I get to heaven, there might be and certainly are things on which I am wrong. Let everything I do be marked by a love for You and a love for others. Let me be one in unity and purpose with all who are following after You. This is a great response regarding who we are and I’m letting you know in advance, I’m going to use it. Some would call that stealing, but those of us who teach (especially in secular education) understand the “borrowing” concept of information or strategy. Thanks for sharing! Each and every one of us are simply repackaging information we have received from other sources. Feel free to repackage or even reproduce (ie plagiarize) anything you want. Your words reminded me of the third verse of this song by Martin Smith Sung by Jesus Culture. It’s time for all the streams to flow as one river. Sorry I don’t know why Robin Mark popped up. No one has seen God but if we love, God dwells in us, how do we know that the Holy Spirit is in us? St. John the evangelist says,”If you love the brothers.” So it does not matter if you are Catholic, a nun, a Protestant, a Jew, a missionary, you go to mass/service daily…if you do not Love then you are not a Christian. This is the way to be one with the brothers. YOU SAID THIS SO WELL! I grew up Baptist…and while we might disagree on some little things…it doesn’t matter because we worship the same God and He is the head of the body and we are all working together for the same goal! This was awesome. We’ve got more reason than anyone to encourage and be in agreement with our bottom line–Jesus as Savior. Why is unity such a problem when it’s the one thing that will mark us as His? Thanks for laying this out so clearly. Thank you!!! I’ve been saying that for the almost 5 years that I’ve been a Christian now and still nobody gets it! I mean they’ll say it, but try to get them to put it into practise and somehow they can’t. I have only recently come to realise this truth. 1 Corinthians 1:10 was always a problem for me when I became a Christian 30 years ago to the point of spending 10 years church hopping in search of the “Right” denomination. That errornous thinking on my part eventually led me into the Jehovah’s Witnesses as I saw their all believing exactly the same thing as Unity without Division. I now realise that it was in reality enforced conformity & totalitarian control in the guise of unity. While I’m attending Church again, I now “Label” myself as nondenominational in the sense that I won’t allow any organized religion to dictate doctrine to me if I can’t see it clearly for myself in Scripture. We all are Followers of Lord Savoiur Jesus Christ. Amen-Amein!! ❤ GOD BLESS You ALL!! Two reasons the Spirit came upon the disciples in the Upper Room: One, there was unity. Two, there was obedience. But not at the cost of the message of the Gospel. Paul denounced the earliest “factions” in the church, but he had to rebuke Peter for shunning born-again brethren to obey the dead letter of the law instead of the life of the spirit and the love of Christ. Jesus also said he brought a sword. That sword is the Word of God. It cuts fine, it cuts sharp, and a whole lot of godless pagans and Pharisees are offended by it because they love darkness more than the light. I don’t know. I always thought Jesus said the reason the Spirit would come on them was so that they might receive power to witness. This is so good. Thanks for making me think outside the box.